Archival mounting practices are key in the protection and presentation of your fine artworks. Face-mounting and lamination options provide protection from dirt, dust and UV rays. Back-mounting options provide stability and allow your artwork to be properly displayed. Proper conservation techniques are a custom practice are systematically practiced in our climate controlled Long Island City facility. Our expert craftsmen tailor a unique and specific approach to suit your mounting and lamination needs from diasec-style mounting to frameless presentations and museum boxes. 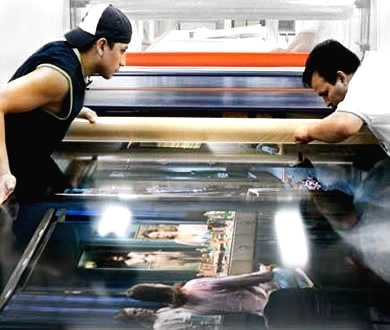 UV Film Lamination- A thin, clear, ph neutral film that is used for protecting a non-traditionally framed or glazed photograph from dust, moisture, degradation and discoloration, available in sizes up to 72” x 120” in matte, glossy and luster surfaces. Ideal for short to midterm indoor applications. Plexiglas- An excellent mounting material, Plexiglas is a flat and smooth surface, both archival and durable. Face-in mounting is expertly done in the diasec-style silicone based process, which provides a crystal clear appearance for your presentation. Available in AR anti-scratch, clear, matte, UV (OP-3) and non-glare surface types. Spray coating- is a direct spray or brush-on UV and waterproof protectant offered for pigment prints only. Highly recommended for flexibility in the stretching of canvas prints to preventing cracking and surface damage, also to further protect unframed pigment prints and to its enhance richness. The coating is available in matte, semi-gloss and gloss. Wood brace- a brace is a structure that is attached to the back of a mounted work. It helps to support the mounted piece and provides a way to hang it on a wall. The structure has a horizontal piece called a T-bar. It fits onto a cleat which must be attached to the wall beforehand. The mounted work then hangs on top of the cleat about 3/4 of an inch of the wall. Aluminum tube brace- a brace is a structure that is attached to the back of a mounted work. It helps to support the mounted piece and provides a way to hang it on a wall. The structure has a horizontal piece called a T-bar. It fits onto a cleat which must be attached to the wall beforehand. The mounted work then hangs on top of the cleat about 3/4 of an inch of the wall. Our aluminum braces are made from rectangular aluminum tubing. They are warp resistant and stable and better suited fror large or oversized works. Cleat system- Available in wood, Sintra or Dibond, the cleat lies flush against the wall and two pieces are cut to “lock” into one another, one on the wall and the other lies 1/4” or 1/8” away from wall. Gives the appearance of the piece floating off the wall. Holds sizes up to 40” x 50”. An H-channel consists of a long aluminum piece shaped in a letter “h” form that is adhered to the back of the piece, which is then hung on nails. Holds sizes up to 30” x 40”. Panel mount/multi mount- For use in displaying unmounted prints, with the same effect of lightness and transparency of a floating mounted print without the need of mounting. The print is sandwiched between plexi then screwed together, so the print does not slip out. Plexiglas- A premium mounting material, Plexiglas is a flat and smooth surface. It is also both archival and durable. Available in white, opal, clear and black surface types in different thicknesses, up to 72” x 120”. Aluminum- One of the smoothest and flattest backing materials, aluminum is available up to 72” x 120”. It is lighter than plexiglas and thin, offered in 0.63 &amp; 0.80 thickness. Dibond is made of two sheets of .012 aluminum bonded to a thermoplastic core. Its surface is smooth, flat and rigid (will not bow), available in various thicknesses, in sizes up to 72”x 120.” Dibond is half the weight of aluminum, making it a premium archival backing material for large or oversized prints. Sintra- An economical, lightweight and archival backing material, Sintra is made of PVC available in 1/8”and 1/4” thickness up to 72” x 120.” It has a low gloss matte finish, with a slightly visible surface texture available in black, white, or grey. Foamcore is an economical, non-archival backing material in sizes up to 48” x 96.” It is lightweight and has a smooth surface, available in black or white. For use in temporary displays and presentations. Gatorboard- Made of a polystyrene core that is bonded to wood fiber veneer facings infused with resins for strength and moisture resistance, Gatorboard is non-archival, but durable for indoor or outdoor use. Available up to 48” x 96” in black or white, in customized shapes if needed. Generally used for temporary displays and presentations. Museum board is the first choice of framer’s, museums and collectors for the mounting and preservation of fine photographic prints and precious documents. It is 100% acid free, made of cotton that is buffered with calcium carbonate for added protection while being displayed or stored. Available in a rainbow of colors from traditional whites to browns and black, in 2, 4 or 8ply thicknesses, up to 60” x 104” in size. A museum box is an alternative to traditional mounting and framing. The box, traditionally 1.5” or 2” deep, lies flat against a wall and conceals the edges of the mounted/laminated artwork, while adding dimension to the display. The museum box consists of a laminated or face-mounted print mounted onto either aluminum, dibond, sintra with a back brace, with a variety of box sides to choose from ranging from aluminum, brushed aluminum, dibond, any color formica, stained wood and painted. Plexi sandwich- A premium mounting material, Plexiglas is a flat and smooth surface, is both archival and durable. The “sandwich” combination of front and back mounting acquires the look of frameless “floating” presentation for your photographic prints. Face-in mounting is expertly done in the Diasec-style silicone based process, which provides a crystal clear appearance for your presentation. The back is then mounted to plexi and lastly, a backing brace is attached in order to hang the piece for display. Available in AR anti-scratch, clear, matte, UV (OP-3) and non-glare surface types. TruLife single sided anti-reflective acrylic provides a contemporary look for fine art and photography and ensures brilliant colors and a true to life appearance that other acrylic products simply can’t match. There’s literally nothing like it to display the true artistic vision…and enhance the viewing experience.